The hilarious cast of Ranger Bay makes a 'How To' video for media and marketing companies about the uniqueness of Ranger Bay. The concept for this video is appealing. I like that it is set in Vancouver. Atonement for starting a city wide riot after a hockey game is a great concept. Hopefully we see more of your creativity in the future. We are committed to raise $1000 for the BC Hospitality Foundation to compete in the Skills 'n Spills event on November 9th. Please help us meet our $1000 goal on Monday, November 3rd, at 7 P.M. at Doolins Irish Pub (654 Nelson Street, Vancouver, B.C.) Ranger Bay & The Goons raise money for the BCHF. Beer, prizes, 50/50 tickets, Live music, perhaps even some stand-up comedy. $15 gets you a burger and beer, and all the money raised will be donated on behalf of the Ranger Bay and Goons creative teams to the BCHF. We are committed to raise $1000 for the BC Hospitality Foundation to compete in the Skills 'n Spills event on November 9th. Please help us meet our $1000 goal on Monday, November 3rd, at 7 P.M. at Doolin's Irish Pub (654 Nelson Street, Vancouver, B.C.) Ranger Bay & The Goons raise money for the BCHF. Beer, prizes, 50/50 tickets, Live music, perhaps even some stand-up comedy. $15 gets you a burger and beer, and all the money raised will be donated on behalf of the Ranger Bay and Goons creative teams to the BCHF. Cheryl Minns at The Other Press. 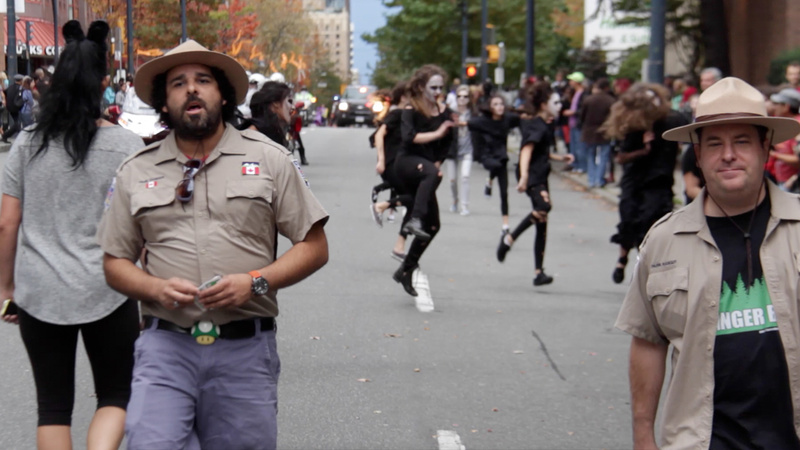 "Fred Ewanuick is the boss in new comedy ‘Ranger Bay’"
How many Park Rangers can you see in this picture of the Vancouver Halloween Parade? Love the style of comedy being pumped out by these beauts. Hype indeed. This is pretty funny and I would like to see more! Hope you make it to the next round. I enjoy the banter and even the live animal audience! I think this concept could be hilarious! I love the two leads - such great comedy chemistry. Can't wait to see this show! The woman who commented below this one is a bit of a turd. It's nice to see such a negative moment spawn such an amusing idea. The chemistry between the actors is already making for some memorable videos, and I hope to see more. WHO is the dude!? So familiar! And has an obvious knack for comedy – just immediately likeable, with nice banter between the two. Though I wish there was more presented here to get really hyped about, the chemistry between the actors -- and the loveable nature of the characters -- is definitely undeniable. This has potential, for sure, to be a charming and relatable program with a distinctly Canadian flavour. I hope to see more! hey cats nothin like it. i really appreciate what you're doing here. youve got serious game and i have become a big admirer. you deserve to win this contest. you are definitely welcome to entertain me any time of the year. keep it up and be the people youve always wanted to be. Enjoyed the banter between these two characters, and would like to see more. With the addition of varied situations and other characters, this "could be a contendah!" The use of outdoors is interesting, as well, and not being limited to interior scenes may be challenging but oh, so interesting. Best of luck on your rise to the top group! This is my favorite video from you guys yet! The live audience joke was really clever, and I liked how Larry kept bringing it up like a total dork. This would be a great character show and it totally feels like Vancouver. I still think your videos would benefit from music accompaniment, that's the only thing that's missing right now. Kind of has a west coast - corner gas - kind of feel to it. Like the humour in the week 5 clip - the laugh are classic miss steps. Sending you well wishes for the top 15 cut off. Haha, live audience. This looks really good though, very different from a lot of other stuff thats going on in the competition. All the best from The Lease team and wish you guys luck. Love what you young sweet hearts are doing. Nice to see imagery from other provinces. Nan loves the outdoors she does. Haven't gone camping in years. Good luck bys! Hard to measure the value of star power. expect to see this project advance. Nice to see established Canadian comedians taking this thing seriously. This media pitch video was really good. Entertaining and informative. The Improvisation/cue card joke was hilarious. The sell-sheet looks great too, well done! 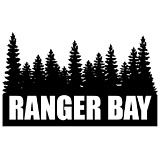 Ranger Bay- I like the nature background for your setting. Looks like the male actor is from Corner Gas. Likeable characters. Like the upbeat theme and quirky jokes. funny idea and a nice lookign sell sheet. lots of great canadian scenery. good acting and a well made video. certainly can see the professionalism! Good stuff guys! Had me laughing at the awkwardness. Although, i'm not sure if the "hype it" aspect was met. Your setting is cool though and the acting is spot on!!! Fred is a real pro and it shows. He sets the comic acting bench mark for all Comedy Coup performers! 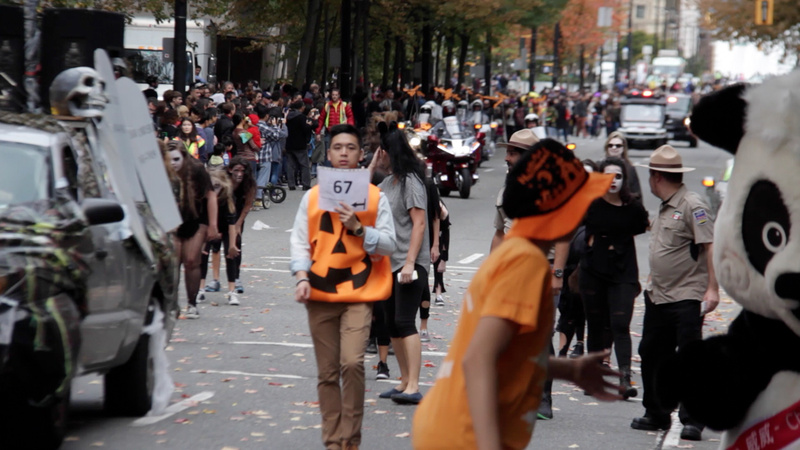 But a few of the others are keeping up, including his fellow actor in this video. I liked it. hahahahahahahaha you two had me laughing out loud on this one, this is the best video you have done for the coup yet! hahaha well done, hope you get to the top 15!! I like what you guys are putting out there - great cast. Your videos have been fun to watch - nice showcase of Vancouver parks. Good luck team! I definitely like the hype vid, can't dislike the cast. You've got some stiff competition, but I think you guys will do amazingly. I sincerely hope they make more than just one show as I think CBC could have a great Canadian lineup with your guys show and a few others here. Who doesn't love watching Fred Ewanuick make funny? Stanley Park is a beautiful location and I can see this show being great for tourism. Probably get some good sponsors too. This certainly has that uniquely Canadian flavoUr that will attract audiences who dig our Canuckian ways. ;-) j.
I liked the play between the characters, and the use of the "icon" of Stanley Park. Good luck! I love this idea! So original and well thought out. The cast is clearly professional and talented. I'd love to see this show win it all! Great concept. Always love the ideas that you have put to paper and brought to film. Great job, be cafefull with sound peaking though! I really like this idea and can see how this would be a funny show to watch on tv. The comedy and improv aspect intrigues me and makes me want to see more. Once again good trailer. I do hope this makes the top 5 and the air waves..
congratulations on making it to the top 55! great job adding the humour in a difficult challenge - I hope to see you in the top 15! I didn't believe the hype. This is a top 15 project for sure!! Seems funny that some viewers have a problem with production quality...did they not hear the comments about budget cuts? I laughed out loud at this week's video. This clip filled my viewing time for the last 90 seconds plus the additional 12 seconds of CBC filler. Hahaha funny as always Ranger Bay! I love that you really gave us a view of the two lead characters. They're comedic relationship is fantastic. Holy crap, I hadn't checked out this project until today, and I had no idea Fred Ewaniuk was involved! Talk about giving your project an edge... Great video, Fred's hilarious as always, and I'm definitely going to be following this one from now on. The animals line was funny. It's true that animals are an audience. I feel like park rangers has got a lot of potential. The hype video showed your guys comedy timing but I'd maybe like to see a bit more of the "hype". I find parks are "hype" because I love nature. I thought your sell sheets were a little busy and distracting but your video was pretty funny this week. I only recently discovered your project and went back and watched all your videos. Your concept is interesting and quite Canadian. Best of luck. Hilarious. This project wasn't on my radar until now - but glad I watched. Would definitely watch these two actors on TV - very charming - Best of luck to you! fred euwanuwick whose name i can't spell properly is super cool, you guys are really lucky to have gotten him involved, best of luck with top 15 voting! Loved the video and the actors. You guys are naturally funny and made me laugh. However, I don't feel I got enough about the show from this mission. Where was the hype?! Congrats on making the top 55 and best of luck!! Improv is a beautiful thing and you guys know how to embrace it! I hope you keep on going with this project no matter what, best of luck with the top 15! I really hope that the show garners some more attention when you move into the top 15 as you deserve. There is a lot of room for some good comedy here as you aptly demonstrated in your hype video. Good luck! As a huge fan of Stanley Park, i can't help but watch this show. I really enjoy some of the deadpan delivery of the lines. Best of luck in the next round of voting! I like the concept, chuckled lots over the hype video and will look forward to more beautiful settings when you make it into the top 15. The cast is great too, so you have 2 thumbs up from me! I really like this project, and the actors you have seem to be very talented, funny, and with solid chemistry. All points which I think are very important to making a show work. Good luck on top 15! I enjoyed that this video previewed some character interactions. I think one of the strengths of this project, (aside from the clever concept), are the people you've chosen to bring this story to life - and I look forward to hopefully meeting more of these characters as the competition continues. So funny. I love the acting and the improvisation skills. I loved the part where he was reading the exact same line as her. Very funny. I'd watch this. cool video. I like the production. I like how you spun the positive aspect of the fundraiser. Keep it up. Im intrigued for whats next. I love that people comment on the existing talent in Canadian TV associated with this show. I would have loved to have an actor like Fred Ewanuick involved in our submission. That should never be a bad thing. I want that guys face on every TV show. Congrats on making the top 55 and good luck getting into the top 15. Interesting video and cast... the experience you bring to the table shows and I guess that can definitely work in your favor. I am looking forward to what is to come next. good luck . Nice job on the sell sheet fellas, and good effort on some of the marketing. The BC hospitality fundraiser was a good idea. Nice way to get some attention and do something positive as well. 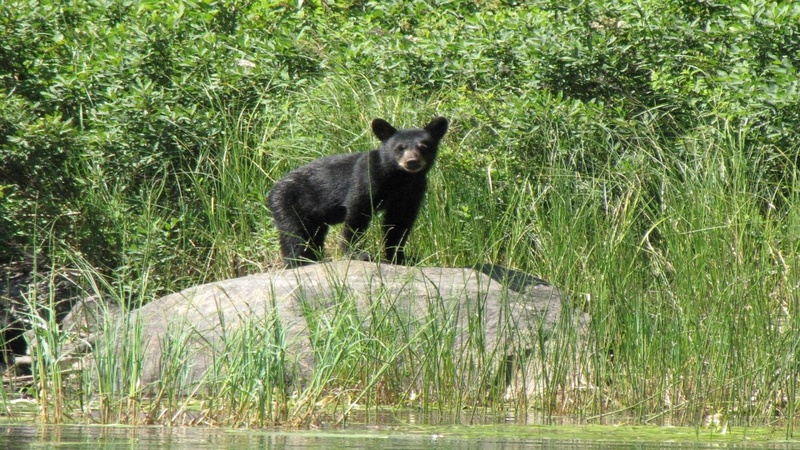 Also great you guys had a picture of a bear from when you were shooting. Cheers Wharf Rats! Very best of luck to you guys! "Filmed in front of a live audience...because of the live animals". IT IS FUNNY TO EVERYONE! I'm not sure how this show slipped under my radar but I'm totally in. This challenge is well done and I don't really have feedback either way. It looks like a real CBC promo across the board. No disrespect to the show and premise but I have to agree with comments previously made regarding "new" talent. While I'm sure there'll be new talent receiving a chance on this project, that can be said of any television program or pitch. Perhaps an actor receiving residuals for 6 years of the most popular show on Canadian television is not the face to represent a search for new talent. Good premise, respect to your show and yourself, and I hope you get to pitch this made and sold to network. I just don't know if this is the appropriate avenue to sell it. If having myself in the show helps, or hinders our chances, I can't speak to that. I don't know. I feel like it doesn't really give us any advantage simply because, I'm not a big enough known actor that people will vote just because I'm in the show. I think that this comp is about the content. If the content is good, that will shine through. Also, everyone else involved with this project is just starting out. Or, haven't had a chance to be involved with a project with a wide audience, and they shouldn't be frowned apon because they asked someone with some experience in the industry to help out. 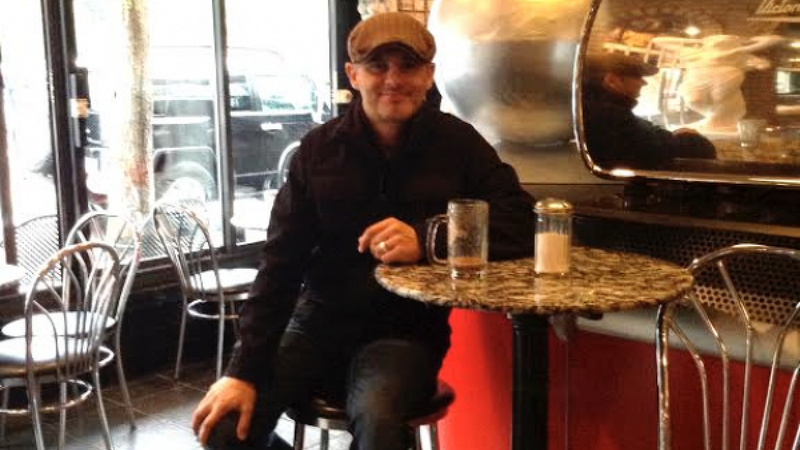 So, even though I have had success to this point, As a canadian actor, I'm always in search/need of the next job. Just like new talent, I'm plugging away. Sorry but I do agree with Adrian. Filling a show with stars takes away from people who are talented and trying to break in. Newcomers have to work hard to get noticed. They all don't have buddies in the industry to push the door open. Please don't tell me that having a celebrity in your cast didn't make you think for one moment that you didn't have an upper hand. If you say no I don't believe that you are being honest. You are of course completely entitled to your opinion, Kelley :) I hardly think one well known Canadian actor qualifies as 'filling a show with stars'. I feel that for you to say it 'takes away from people who are talented and trying to break in' takes away from every single amateur actor in our cast, which is everyone else. We have all been working hard to be noticed for as many or in some cases more years than the actors in other projects. We have dealt with the same rejection and opposition for just as many years - we're on a level playing field. The work is the work. It doesn't matter who you have on your team. If its not good, it won't succeed. We may have a known face and I won't argue that it hasn't helped us - but why wouldn't we take all the help we can get? We deserve a shot just as much as the next project. There are several projects in this competition that went into it having actors and comedians with HUGE fan bases - far bigger than ours. I don't see that our project has any upper hand over anyone else. Awesome! That was super funny. Great video Rangers. Both of you have fantastic on camera presence. Ms. Peebles always makes me chuckle :) I'm pushing for you to make top 15! <3 Right back at you, kiddo! I really liked the hype video, didn't find the same problems as some others, but agree that the sound had an issue. I guess you needed a better wind muff, but the voices were still clear, so that's great! Love the funny. I commented already but apparently my comments aren't long enough. Lucky for you, I like your project enough that I would comment twice anyways! 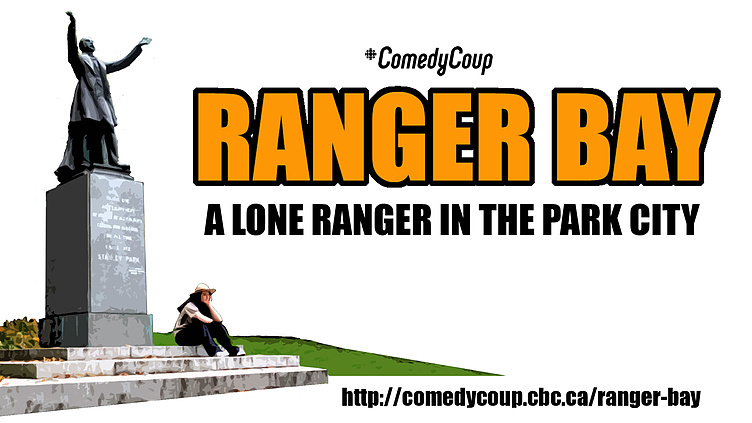 I would be super stoked to see a comedy about park rangers set in Vancouver. I'm looking forward to see what else you guys come up with! Haha thanks Elaine! (Twice) You're awesome! Video was all right. A mix of humor and information, I feel like I got a good sense for the show. Energy was a bit lacklustre. Best of luck. Constructive commenting on your video. Keep doing what you are doing. It is all about keeping making good things. I really like the beginning of your video and how you two interacted with each other. I thought that was such a good idea and you did that so good! You were both funny that way. Because you were filming outside, I thought the sound could have been better. Good luck to the team! Sorry but once again someone who has been on a Canadian comedy that was successful. I really believe that this should be a showcase for up and coming groups. Not trying to be mean but you can probably take your idea to the CBC and have an interview right away. I like it! The characters and the actors have great chemistry. Would definitely try to tune in if it aired! funny! could use better technical work though.. audio horrible, weird framing, bad cuts..
Great job. I really enjoy the chemistry that your actors have. The outdoor setting of the show really intrigues me and I want to get to know your characters more. Hope you make it to top 15! For the longest time, I thought this was heralding the return of the much beloved show "Danger Bay". Luckily, my disappointment was only momentary, because the guy from Corner Gas is maybe in this. What I love about Ranger Bay is the blend of references between what is real (Stanley Park, Stanley Cup Riots) and the fictional characters portrayed. Fantastic casting of the park rangers! I want to see more of them! This show will lend itself to so many story lines; can't wait to see what happens next. Well done Ranger Bay, and good luck in reaching he top 15! I enjoyed the way you kept this video completely in character. The pitch side of the mission was perhaps too understated?? But it was engagingly funny – one of the best of the week. Good luck on making it to the next round! This has a lot of potential. Great on camera chemistry between the two main actors, very funny! The production value is lacking, but that doesn't matter too much. You're generating laughs, that's what counts. Very funny video, I thought you guys explained your concept very well to the media. Also, I think it's really smart that you are planning to team up with another group for this weeks event. Sounds like you guys are going to have a blast! I've watched a lot of these videos today - many of them from non-established kids with a passion and penchant for filmmaking - and this is the second one I've seen with relatively notable Canadian stars, and very poor production value. Content is king, but other people with fewer resources have managed to outdo some of the big hitters. Good back and forth between you guys. I like the sell sheet too, can you use a Lego product? If you can more power to you. Always entertained by these two Ranger characters. They really do have great on-screen chemistry. I'd love to see this concept for a show flushed out and really see what these two characters can do with their own show. Keep up the good work and I hope you get through to the next round. I know I'll be voting for you!!! good job on the video and I like the lego ranger man on your sell sheet! Hahaha! I love this! The animals. Also, these two have killer chemistry. These two are very funny, they work so well together. With such masterful delivery these two could stir up a lot of funny! I love the short jokes in every scene! Great comedy writing! Super funny and totally charming. Nice job guys! Aha! your secret is out - the animals are live but your cameraperson (sic) , is not! Is he/she (sick ?) Very shrewd use of selfie skills. (or is it skilled use of shrews themselves) ; Enjoying your work, good luck with the competition. I think you have good chemistry with the two leads and obviously a beautiful backdrop for the show. The theme of the cutbacks is funny and relevant to cbc for sure.